(C) Nefer Khepri, 2012. The god Mercury, Palace on the Island of Corfu, Greece. The planet Mercury rules over Travel, Technology, and Communication. Three to four times a year it appears to the naked eye to be traveling through its orbit backwards. This is actually an optical illusion, however, when this does occur it appears that here on our little planet things can start to go askew. During Mercury retrograde periods we experience more snafus and screw ups than usual. If you’re traveling your luggage could get lost, flights can suffer lengthy delays, and reservations can be mysteriously canceled without your prior approval. Also, as I found out the hard way last June, you can also suffer very bad accidents when traveling during a retrograde period. This is something that I will never ever do again. Mercury rules over technology as well and you can experience more vehicle, electrical, & computer problems during a retrograde period. We have an icemaker in our refrigerator/freezer that always knows the very DAY Mercury goes retrograde. It decides to become jammed and will repeatedly jam throughout the retrograde period. Once Mercury goes direct again the icemaker suddenly decides to exhibit stellar behavior; that is, until the next retrograde period when it suddenly decides to once again misbehave. Computers can be badly affected so I do caution you to be sure if you are planning a backup of data or pictures to do so BEFORE the retrograde period begins. Never attempt to do any major backing up on your computer during a retrograde period. I had a friend who did this (despite my warnings) and she lost ALL her vacation pictures in the process. Play it safe and do such work when Mercury is behaving. Mercury retrograde energy can cause appliances to go on the fritz. Unless the appliance is absolutely broken, try not to worry & work around it. In most cases the appliance will begin to operate properly once Mercury has gone direct. This happens to our icemaker EVERY time. Vehicles can be adversely affected as well. Should your car need some work done on it try to do this before or after the retrograde period, never during. This is when screw ups occur and your mechanic may do something wrong that causes even more problems. If at all possible, wait until Mercury goes direct. My husband lost control of his car hitting a pothole. It was the first day of a retrograde period. He had no choice but to have his car worked on since his little accident had caused him to go up on the curb and it caused damage to the undercarriage of his car. It was repaired, but the car was never the same again and he ended up trading it in within a year. Now, was that due to just a bad mechanic? One he still uses to this day who always does a fantastic job? Or was that due to the energy of the Mercury retrograde? We will never have a definitive answer either way, but play it safe. If your car can wait, then let it wait. Do not make any major purchases during a retrograde period. This is another thing I did before I knew any better. I actually bought a car right in the middle of a retrograde period, but I didn’t know about Mercury retrograde back then. Three months later that car was in the shop. The starter had gone out. A few months after that it was the alternator. Then the starter again, then the alternator again. In the end, after having the car only 3 years it had gone through 3 starters and 4 alternators. That must be some kind of record. I will never buy a car during a retrograde period again. People tend to suffer from miscommunication and misunderstandings during retrograde period. This is why I recommend to my clients that they not enter into any binding contracts during a retrograde period. I’ve seen many cases when the fine print has been either misunderstood or missed completely, the person signs anyway and is in for a lot more than they initially bargained for. Also, relationships do tend to suffer from this as well. Every relationship is dependent upon good communication. When Mercury goes retrograde people assume they know what their partner is thinking when they really don’t or they make other assumptions or totally misunderstand something and arguments can result. Be careful how you communicate with others, and by all means try to avoid texting at this time. So much gets misunderstood in text, email and online due to the fact that facial expression, vocal tone, and body language is absent. Call the person instead. That is pretty much the Do’s and Don’t’s of any Mercury retrograde period. If you can stick to these guidelines you should not suffer from any major issues unless Mercury is in your sun sign of your astrological chart. For example, I’m a Gemini with Mercury in Gemini. Plus, the sign Gemini is also ruled by Mercury. Retrogrades can hit me particularly hard so I always do a protection spell for myself and also for my family prior to the start of every retrograde period, except for the one that occurred last June. That one snuck up on me and I felt the aftereffects of that until just a few weeks ago when I took a very bad fall when on vacation that resulted in six months of pain. My husband had a lousy boss who only gave him a small window during which he could take a vacation so we had to travel during a retrograde period, otherwise we never would have done it. Afterward I told him if we’re ever in that position again we are having a stay-cation and staying at home. I absolutely refuse to travel during a Mercury retrograde ever again. We didn’t have any flight or reservation problems, but the fall I took ruined the entire vacation and my birthday for me. Never again. EVER. The effects of a Mercury retrograde when it causes things to go wrong are usually temporary. It will pass and things should return to normal once Mercury goes direct. Try not to get all wrapped up in what’s going wrong. Instead, focus on the countdown to the day Mercury goes direct. One more thing: Mercury retrograde energy can often be felt 1 – 2 weeks prior to the actual start date of the retrograde period and also 1 – 2 weeks after the end date. This has to do with the shadow of Mercury and how it moves, so do beware of that as well and proceed with caution. Wishing you all safe, happy, and harmony Mercury retrograde periods for 2015. 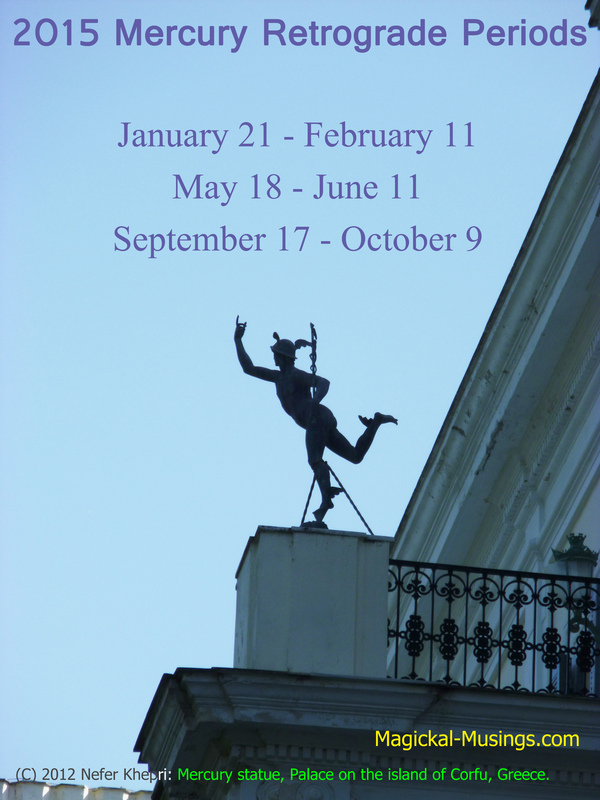 The current Mercury retrograde cycle begins Monday, May 18th & runs through June 11th. Here is some basic information on what it is, how it can affect us, and what you can do for smooth sailing during this time period.